Buy a signed copy from our online shop! Summary: The first FBorFW collection!! Elizabeth is still a baby, just learning to talk, and five year old Michael develops his first crush on Deanna. Who could have foreseen what was in store for this loveable family? 1982) Is This "One of Those Days", Daddy? 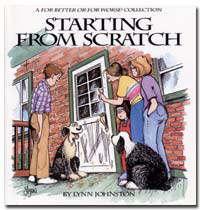 Summary: In this, the second FBorFW collection, the Pattersons add a new addition to their family—puppy Farley. Farley's antics are sure to bring a smile to your face. Michael joins the local hockey league, and first meets Gordon, who soon becomes his close friend. Summary: The Patterson family is growing up! Elizabeth is in daycare and Michael is in school, which gives Elly the chance to spread her wings. She volunteers at the local paper, reconnects with her writing abilities, and rediscovers what working outside the home feels like! Summary: A collection of Sunday comics from the first years of FBorFW. 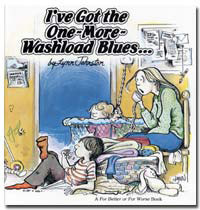 Summary: The 4th collection book further delves into the trials and joys facing the Patterson family. Michael runs into trouble at school with a bully, Elly gets an actual paying job at the library, and Elizabeth gets into everything!! The family also travels west to visit John's sister and her family on their farm—an educational experience for everyone! Summary: A collection of Sunday strips from the early years of FBorFW. Summary: Michael is beginning to grow up, as he flies alone to visit his grandparents in Vancouver. Elizabeth gets lost at the airport, Elly goes on her very first business trip, and John is left home to keep things in order—you'll have to read to see how that turns out! Summary: Elly gets a taste of fame as one of her poems is published, giving her a renewed passion for writing. Connie and Lawrence move away, and Lizzie gets to be a Christmas star in the school pageant. 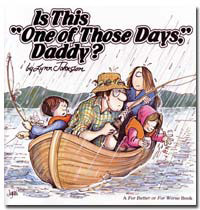 Summary: John and Phil, Elly's brother, decide to go camping—and go missing after their canoe gets swamped! Connie gets remarried and moves back to the Pattersons' neighborhood with her new husband, Greg, Lawrence, and his two teenage stepsisters—which gives Michael a new target for his pranks! 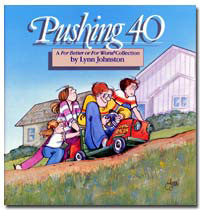 Summary: Pushing 40 continues Johnston's lively and entertaining portrayal of family life. 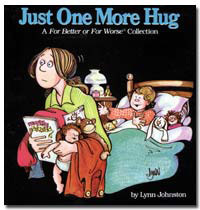 Lynn approaches the death of a family friend, Mrs. Baird, in this collection, proving that comics can effectively cover serious matters. Summary: The 10th anniversary collection is a special edition, with bonus content in addition to the strips. Michael, who turns 13, finds his raging hormones getting him into trouble again and again. Michael's antics at summer camp will have you rolling with laughter. 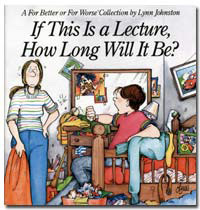 1990) If This is a Lecture, How Long Will it Be? Summary: Living with a teenager isn't easy—just ask the Pattersons, who are dealing with a teenage boy, and the attitude that accompanies him. 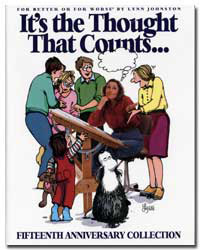 Michael finds his first real girlfriend in Martha, and Elizabeth feels the crunch of being the youngest, but finds her niche helping her dad in his workshop. 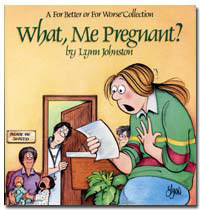 Summary: Elly, who is juggling a new job, the adolescent traumas of Michael and Elizabeth, plus the usual housework woes, finds out she is pregnant!! 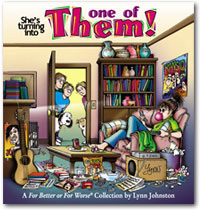 The shock finally wears off, and the family deals with the idea of another person in their household. The Pattersons soon forget their worries and focus on the beautiful new baby girl, while once again getting used to midnight feedings and changing diapers! Summary: Michael travels to Winnipeg, to work on his Aunt and Uncle's farm for the summer, and takes his driving test. Elizabeth is discovering boys, makeup, and designer clothes while struggling to fit in with the "In Crowd". April starts teething. 1993) There Goes My Baby! 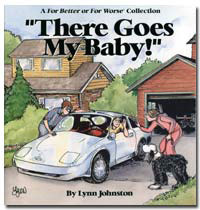 Summary: This collection further illustrates Lynn's ability to probe serious issues. 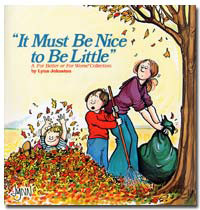 It includes the sequence in which a teenage family friend, Lawrence, reveals that he is gay (leading to a Pulitzer Prize nomination for Lynn). 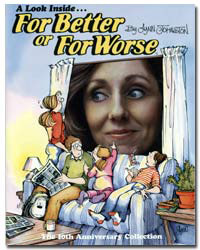 Also included, of course, are the standard foibles of teenagers, trials of tots, and the stresses of marriage. 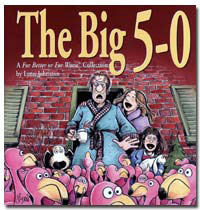 Summary: This 15th-anniversary collection is a special treat for FBorFW fans. 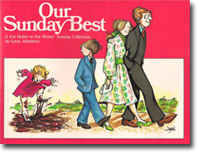 It includes a look back at Lynn's handpicked selection of color Sundays, the birth of April, Lawrence's revelation sequence, aging parents, and much more. 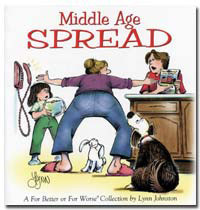 Lynn has also included her own amusing commentary about some of her favorite strips. 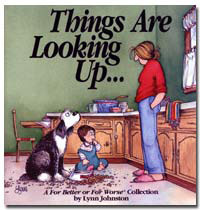 Summary: The Pattersons face the daily challenges of raising three growing kids, an aging sheepdog, and now Farley's bouncy puppy Edgar. 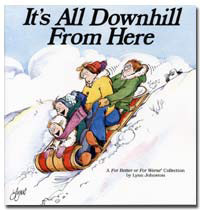 Farley tragically exits the strip in this collection, and is remembered as a hero. Summary: In this collection, Michael and Elizabeth discover that affairs of the heart are often more about pain than passion. 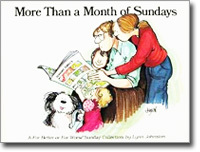 Join the Pattersons as they go about their daily lives—lives not unlike our own. 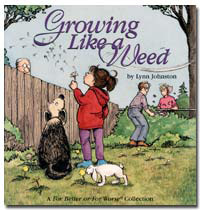 Summary: This collection often focuses on Michael, and his friend Weed, but is also a look into the growth of the Pattersons as a family. Elly and John are adapting (not always gracefully) to the onset of middle age. April is growing taller, Elizabeth more mature, and Michael more independent. 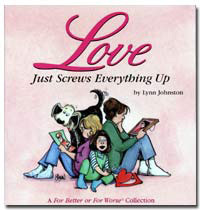 Summary: Lynn again tackles the concerns of middle age, as Elly's aging mother is hospitalized, and Elly goes to Vancouver to visit, bringing April along. Later, John and Elly take a road trip to Florida. Elizabeth creates a new look for herself, Michael tries to get through his second year of university, and April becomes "Sockhead the Super Hero". 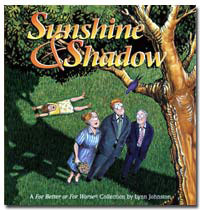 Summary: Sunshine & Shadow is the only For Better Or For Worse collection that focuses rather consistently on a serious subject. The Patterson family's lighthearted approach to living continues, despite their journey into the inevitable experience of loss as a loved one passes on. Summary: Join the Pattersons as John celebrates his 50th birthday, and deals with some of the side effects of reaching this milestone. Elly returns to work at Lilliputs, Liz decides she would like to be a teacher someday, Michael wins an award for his writing, and April teaches her mother how to use the computer. Summary: Follow along as the Pattersons enjoy another year of trials and smiles. Highlighting Michael's graduation, and his engagement to Deanna, this collection is filled with memorable moments, including Elizabeth's departure to university up North. 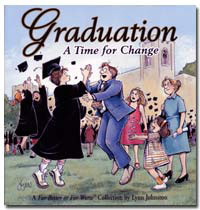 April enters grade three, making Elly and John wonder where the time has gone. 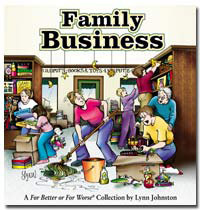 Summary: In this collection, the Pattersons join forces to buy and reorganize the store where Elly has worked for years. Through their efforts, the Pattersons learn even more about their relationships with each other, and how great it feels to pull together as a family—and to celebrate their accomplishments. 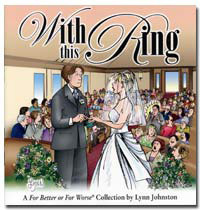 Summary: In this collection, Lynn recaps Michael and Deanna's relationship... along with a closer look at Mike's new in-laws. While Michael is celebrating marriage, Elizabeth is trying to keep her relationship with Eric together! April impresses everyone at a recital, and Grandpa introduces the family to his new companion, Iris. Summary: They say life is what happens while you're busy making other plans. In the latest update on the Patterson family, life is happening—and a few new realities have set in. Still adjusting to their status as newlyweds, Mike and Deanna find that two cannot live as cheaply as one, and then they learn an unexpected baby is on the way. After discovering that her live-in boyfriend was cheating on her, Elizabeth swaps steady date for blank slate. Grandpa Jim catches everyone (including himself) off-guard, when he and Iris elope. Life, it seems, always has a new surprise in store. Summary: Parents apprehensively face their fifties, a young couple tackles new parenthood, a young woman confronts career choices, and a girl loses a beloved pet, Striking a Chord brings compassion, understanding, and a lighthearted touch to every human interaction. 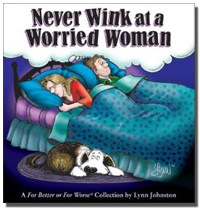 Summary: In Never Wink at a Worried Woman, life is progressing for each character. 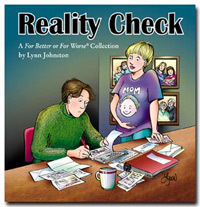 Elly and John think of retirement, while still being preoccupied parents of a preteen. Michael and Deanna grow into their roles as new parents, while Michael's career gets a boost. Elizabeth begins her student faces the fact that Anthony is marrying another. April is racing to turn 13, busy with her band and also helping out at Lilliput's, where she makes a painful discovery about a co-worker. Add in Grandpa Jim's quest to maintain his aging dignity, and baby Meredith's burgeoning curiosity, and you get a full dose of family life. 2006) She's Turning Into One of Them! Summary: In this collection, Elly experiences the downside of being a business owner, when one of her staff is caught stealing. Michael and Deanna enjoy another pregnancy and the birth of their second child, Elizabeth moves to Mtigwaki to teach, and the character Shannon Lake is introduced. 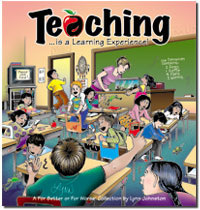 2007) Teaching...is a Learning Experience! 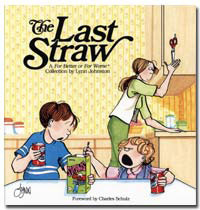 Summary: In this collection, Mike and Deanna move to Lovey's upstairs apartment, and meet their new neighbours, the Kelpfroths. Liz returns to Mtigwaki after her assault at the hands of a co-worker in Milborough. Elly attends a pow-wow while visiting Elizabeth, and later bumps into Constable Paul Wright, setting interesting events into motion. April spends a summer on the farm in Manitoba, then begins high school. 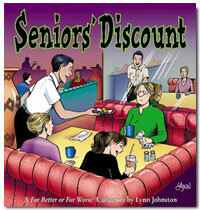 Summary: In this collection, Elly faces the fact that she has reached the age of the seniors' discount—and doesn't quite appreciate the government's largesse. 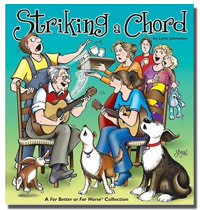 Grandpa Jim celebrates his 85th birthday and suffers a stroke, Mike and Deanna adjust to the demands of parenthood, Elizabeth accepts a teaching position that brings her back home, and April strains for more and more independence. Summary: In Home Sweat Home, many moves are afoot. 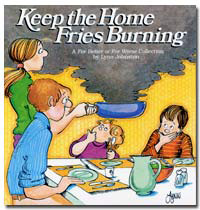 John and Elly downsize to a new home, and Mike and Deanna buy the family homestead to raise their children in. Romantic moves abound, too, as Elizabeth has her heart broken—only to have it won back by Anthony. April turns sixteen and will soon by driving—which is driving her parents crazy. 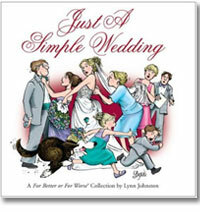 Summary: In Just A Simple Wedding, Elly and John, now grandparents, adapt to a smaller home, while Michael and his family spread out in the old Patterson house. Elizabeth and Anthony celebrate their wedding, bringing things full circle.